On the hunt for the right power washing company to help clean up your home or commercial property? With a lot of things to consider, hiring the best power washing company may sound overwhelming. A lot of people have no idea about power washing until they need help and are looking for a professional company to do the job right for them. But let us make things a bit easier for you. 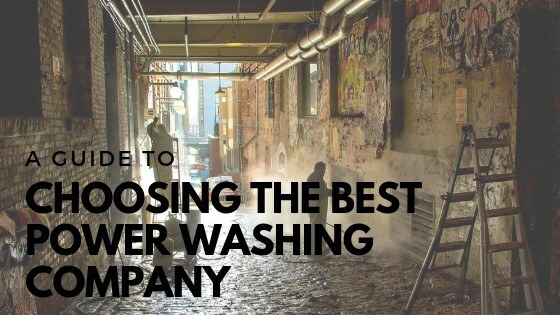 Here are a few things to guide you in choosing the right local power washing professionals. We all love saving money. But keep in mind that you get what you pay for. A certain company will charge cheaper than the others for a reason. Before you choose the cheapest company, be sure to check that they provide quality power washing services. So, be sure to consider others things as well aside from the cost of service. Always choose a company that’s professional and trustworthy. Why? Because only these kinds of companies will compensate you appropriately in case something goes wrong with their service. When requesting a quote, ensure that a guarantee is written into the agreement. It will give you peace of mind knowing that if they don’t do the job properly, they won’t run off with your money. Lots of people simply choose the first company they managed to find. Don’t be like them. Shop around to compare and get the best deal (not necessarily the best price). Remember that estimates should be free. You should also consider personally visiting the company and based on what you saw, decide whether they are professional and experienced enough to hire. Reputable companies will have enough business to justify a physical office location, and this helps you weed out the inexperienced companies just starting out. I told you we’d get back to this because it’s important! Insurance is one of the most important things that you should consider when looking for a power washing company. Whether you like it or not, accidents can happen. And insurance will give you peace of mind that the insurance company will compensate you if any untoward incidents happen. Most of the time, the best information you can get is at the tip of your fingers. Make good use of the internet and check online reviews. You should also find time to check the company’s website. All professional companies should have an online presence, and I’m not just talking about a Facebook page. Serious businesses almost always have their own website professionally built. Past customers experience that is shared through online reviews is always a good basis of how well the company is with their service. If you’ve seen a handful of negative reviews, think twice. But if it is just a handful out of dozens of 5 star reviews, that’s a sign of a good company that’s doing a lot of business in the local area. I’d recommend a company with 20 reviews and a 4.7 rating over a company with only three reviews and 5 stars any day of the week. They should have professional equipment and materials. Paying for a professional power washing company means you are also paying for their professional standard equipment and materials. This will ensure that they will carry out quality work for you. If they’re using something that you can purchase in the store at an affordable price, then most often than not, they aren’t a professional power washing company. If you’re looking for a professional and trustworthy power washing company then your search is over. Contact Get Superior Cleaning now for a free power washing quote.